I thought The Secret History of Moscom was only okay. I found The Alchemy of Stone entrancing. She created one of the best clockpunk characters so far with Mattie. it`s a good book but for me it was far from an enthusiastic read..
A thorough review, Mihai, that has compelled me to place it upon my TBR list. Great review! 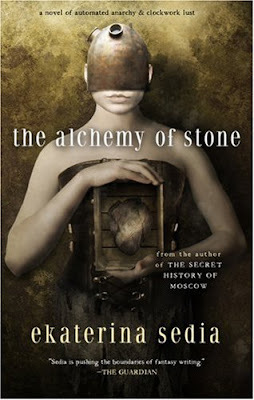 So I'm not the only one who liked The Alchemy Stone more than The Secret History of Moscow. I agree with Liviu that you have to try Clockwork Heart by Dru Pagliasotti. Two men, even brothers, struggle for one woman in a steampunk world including sleuth. This isn't a fast pace story. But it contains action, romance and a good world building.